One side of Sugar & Olives — Jennifer Balin’s fun, funky space just over the Norwalk line, across from Bowtie Royale 6 — is a restaurant. The other side is an event space, for receptions, celebrations, and bar and bat mitzvahs. People don’t celebrate on weekday mornings or afternoons. They work then. Of course, they work differently than they used to. They work at home — surrounded by kids, dogs, house cleaners and leaf blowers. Or they work at Starbucks — surrounded by conversations, constant movement, and baristas calling out wrong names. Balin — a longtime Westporter who raised 4 kids while also running Sugar & Olives — has turned her event area into a co-working space. With big tables, high-speed internet, lots of fast table-top charging stations and floor outlets, a laser printer, desk lamps, a tall standing desk, free coffee and tea — plus discounts at the restaurant — it offers the kind of quiet yet creative atmosphere you can’t get at home. 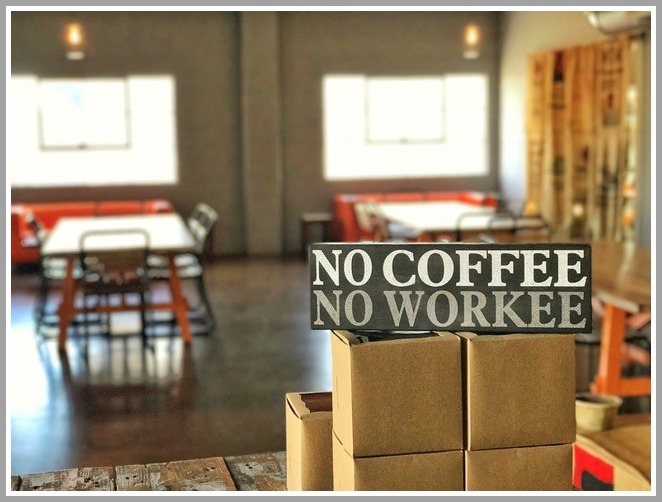 The co-working space at Sugar & Olives. Westport author Jane Green is a strong advocate. She encouraged Balin to post the idea on Facebook. Dozens of residents responded. The co-working space is open 9 a.m. to 5 p.m. — though Balin can be flexible. Oh, yeah: There’s a free social networking breakfasting every Wednesday. This entry was posted in People, Restaurants and tagged co-working, Jane Green, Jennifer Balin, Sugar & Olives. Bookmark the permalink. Here’s my favorite article on this topic of co-working space, entitled Laptopistan. Appeared in the NY Times in 2010, but still quite relevant today. I think this link gets you through the NY Times “paywall” to the article. And my personal favorite – with no fees whatsoever is the Westport Public Library. Cute article, with questionable connection to the world of 2017, which yields a richness and incredible variety of (economical) co-working options. & of course, the 06880 Public Library is wonderful, for many folks. So smart! Great thinking Jen! When the Westport Library was producing this year’s Maker Faire, we went to Sugar & Olives to get things done. Sometimes, you need to go where no one is looking for you.